This alert is expired. For additional emergency information, please visit www.SDCountyEmergency.com or call 2-1-1. This is the San Diego County Sheriff's Department with an emergency evacuation message on 08/13/18 at 4:35 pm. There is a fire in your area of San Pasqual Rd. Emergency responders are currently addressing the situation. An evacuation warning has been issued for your area. 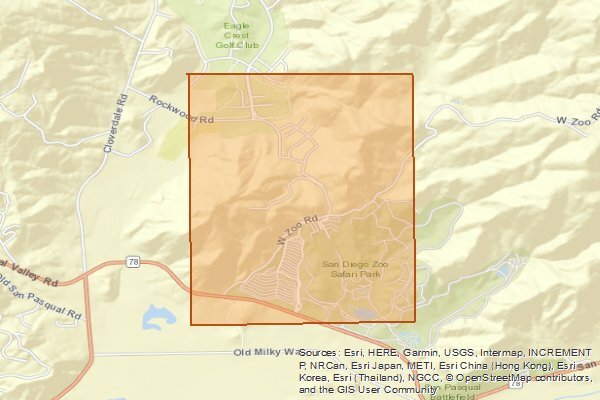 An evacuation warning means that evacuations are currently voluntary, however everyone should be prepared to evacuate if an evacuation order is issued.Residents who choose to evacuate can go to San Pasqual High School located at 3300 Bear Valley Parkway. Route is east on State Route 78 take Old Milky Way back to San Pasqual Rd which dead ends into Bear Valley Parkway. If you need emergency assistance with evacuation, call 9-1-1. If you need additional information, visit www.sdcountyemergency.com or call the San Diego Sheriff's Department non-emergency line at 858-565-5200.